In my big shot class last month, I thought it would be a good matchup to use the Elementary Elegance Sale-a-bration set (one of my favorites this year) and the movers and shapers die that comes with the curly label shape. Because I have this set in clearmount it was easy to line up the stamp with the window. And we used the curly label punch for the greeting, a perfect fit. 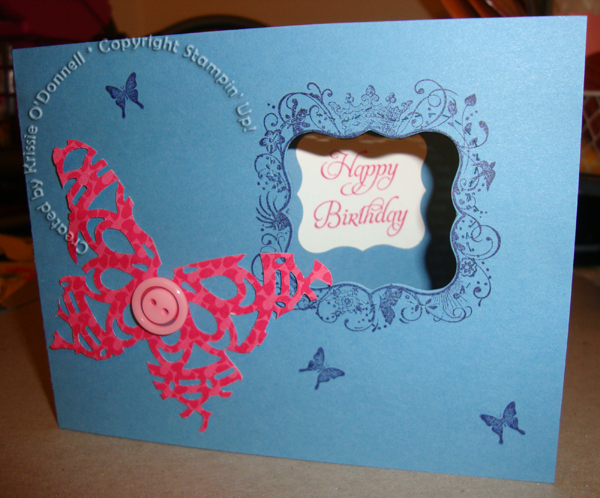 I also really liked the doily cut-out butterfly in the Occasions mini, so I did my own spin on it to match up with this card. Love the color combination.